There are probably two main challenges that beginner tomato gardeners must overcome. The first is deciding on the kind of tomato they need to grow. No! It’s not as easy as you are thinking – for the novices of course. There are various tomato varieties which include Brandywine, Beefsteak, Mortgage Lifter, Purple Haze and Boxcar Willie to name just a few. Your choice should probably center on personal preference, climate and disease resistance. The next hurdle that you will need to overcome is deciding on the most appropriate support for your plants. You can take the route of concrete reinforced wire or use bamboo poles – whatever suits you. However, there are tomato cages in the market you can get and make your tomato growing so much easier. The following is a review of the best tomato cages in the market to assist you in your decision-making process. 1 And what are Tomato Cages? And what are Tomato Cages? The key to a perfect tomato – the sweet, tangy, firm, juicy and blemish-free – lies to a large extent, on the variety you choose. However, the manner in which you grow it plays an important role. Unlike other plants in your garden such as cabbage, tomato plants need support. The leaves and fruits can easily touch the ground attracting pests and diseases which apparently is not a good thing. In the past, farmers used to pound long sticks into the ground, and the vines would be attached to them using strings. While there are some gardeners still using the sticks method, contemporary farmers use metal cages. 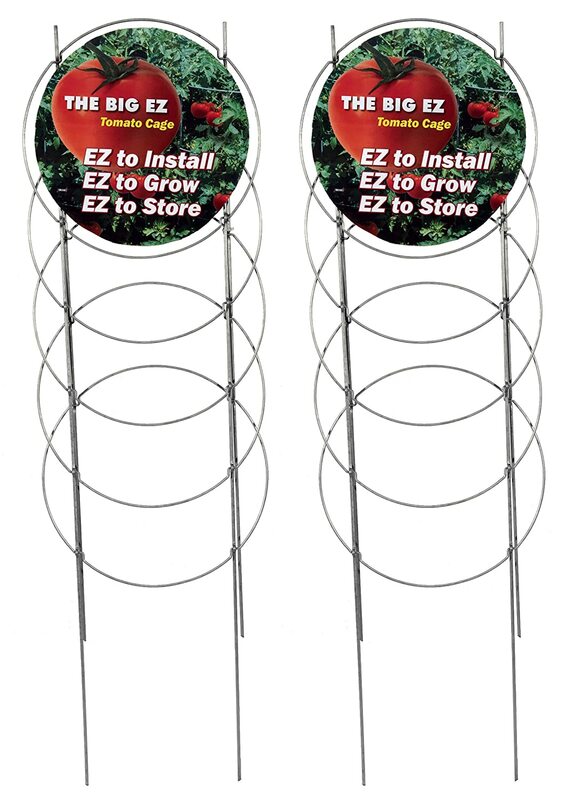 The best tomato cages are metallic and have horizontal supports where the plant can hang onto as they grow. Strong: a tomato cage needs to be strong to hold up the increasing weight. At first, the plant is frail and can fall under the slightest of touches. At such a time, it is easy to support, and any type of cage will do the work. However, the real test is when it is fully grown and heavy with fruits. If you choose a cheap and shoddy quality cage, then you may be in for it. Invest in quality products for best results, and it will not come a time when you throw the cage away in frustration. Versatile: the best cages are handy. This means that they are adaptable to the various stages of the plant. There are ‘green thumbs’ out there that can easily grow the plant to hilarious heights. If yours is a flimsy construction that cannot be adapted to the increasing size, then you might, as well, consider yourself beat if you can’t come up with an alternative solution. The variety: there are different tomato varieties, and they grow differently. The only common thing about them is that they are vines and require adequate sunlight, as well as, water. Some of the patio tomatoes are shorter and are standard with gardeners that have limited space.However, some determinate varieties can quickly grow in height, and some of them are known to go as far as eighteen feet. The best cage will provide easy access to the plant for maintenance and harvesting. Therefore, determine the most appropriate size for your variety before making a decision. The price: if you are serious about growing those succulent tomatoes, then you need to invest in quality cages. Going for those at giveaway prices will leave you nursing your losses as they will easily bend or break when the tomato plant comes of age. This can leave you scrambling for a makeshift support to save your plant. The joy in gardening comes mostly in watching the plants mature and thrive under your watch. Invest in quality for a fulfilling gardening experience. The material: you will find cone galvanized metal cages in the market with three prongs being the cheapest and the most common. The downside with these tomato cages is that their rings easily bend and break when the plant is big. They are also not stable and will move in the direction of wind and strain during heavy storms. As they age, the zinc coating can become an eyesore.If you must go for metal cone cages, make sure the gauge is heavy and preferably go the four-pronged way. Powder-coated cages are not so bad and can come in various colors to match your décor much to your liking.The triangular and square metal cages are sturdier than the cylindrical structures you may come across – forget the beautiful designs that may blind you, we talking real stability here. They are four-pronged and do not wiggle under different weather conditions. Triangle and square shapes also provide sufficient room for the plants to climb and find support. As a tomato farmer, you are going to need a sturdy cage to support your growing plants. The good thing about this product is that it will support your tall tomato plants. This means that you will not have to change it grows in size – quite convenient. The structure has adequate spaces for easy harvesting, and you will not have to squeeze your hands in small areas. And unlike some of the other products in the market, this cage supports your plant on all the sides, and you don’t need to tie them. During the off-seasons, you can easily fold these cages for storage. 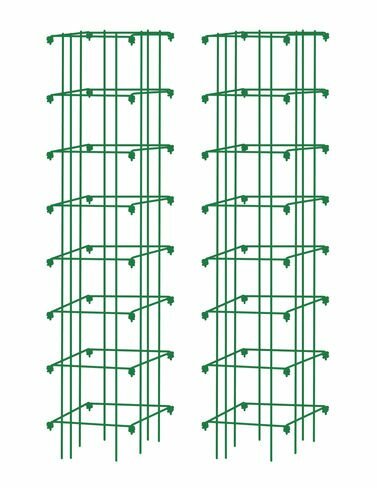 You will want something simple to assemble when it comes to tomato cages. The good thing about this cage is its simplicity. It may take you only a few minutes to join and be off to some other task. The structure is sturdy enough to support your blossoming tomato. It is five feet tall which may be adequate for some of the indeterminate varieties. For added support, the structure comes with three embossed rings. And in addition to all this, the obelisk structure is quite appealing and is something you will be proud of having in your garden. This is one heavy-duty structure that will last a long giving you a service of use. The material is sturdy galvanized steel that will not bend under the force of the elements. This tomato cage comes with five rings for additional support. They ensure that plants have adequate branch support. You can push the legs of this structure into the ground for a better support and can then withstand harsh weather. The product is also easy to fold and store during the offseason. Tomato farmers will require several structures for their plants. This product comes in a set of four cages and at a favorable price. You may not have to keep running to the stores for additional cages when you feel the need to add the number of plants in your garden. With these cages, it may not be necessary to tie the vines as they receive adequate support in all sides. The structures have 8 inches square openings for easy harvesting. And interesting enough, these products have hinged panels for easy storage. The first thing you will notice about this cage is its clean, professional look. It is easy to fold and will not give you much trouble during the offseason. And unlike some of the similar structures in the market, these cages are constructed on the extra thick galvanized wire. The attractive thing about this material is that it will not rust. It will last you many years of service supporting your tomato plants – this is actually the primary goal. This is one versatile product as you can easily use it on a variety of vining plants such as peas and beans. When looking for the best tomato cage, you will be looking for a stable structure that will easily withstand the elements while holding the plant together with the fruits. You will also be looking for a structure that is easy to assemble and use. A foldable structure will save you the trouble of storing it. Most of the above products easily make the cut. However, the Gardener’s Supply Company Square Tomato Cage stands above the rest easily. This cage is sturdy, will support tall indeterminate varieties and can easily be folded during the offseason. The cage is also rust-free and may give you a good number of service years. There are also other tomato cage reviews around but these are by far the best picks.